Stins Coman is selling its solution that uses light from light-emitting diodes to deliver the internet in the U.S., Israel and China. Li-Fi is looking to compete with Wi-Fi’s radio signal in transferring information with speed and reliability. In April 2014, the Russian company Stins Coman announced that it had developed a wireless local network called BeamCaster. 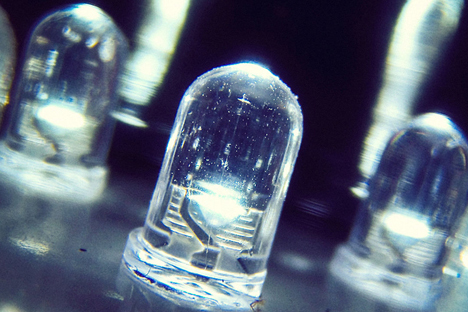 This innovative solution transfers information to electronic devices with the help of light. The core of the network is a router that is capable of transmitting a signal using a light beam at a distance of up to 23-26 feet (7-8 meters). The signal can be transmitted to eight devices at once in other parts of an office, and access speed is four times faster than standard Wi-Fi. According to its developers, BeamCaster offers several advantages; for example, the mobility and speed of its configuration. Li-Fi is unique in that it creates a digital binary code with a light beam, while Wi-Fi transmits data using radio waves. “All you have to do is install the transmission model on the ceiling, configure it toward the receiving modules on the work computers, and you’ll get a working network in the office in just a couple hours that can quickly be disassembled if necessary,” said Dariush Zayents, head of the Russia office of RiT Technologies, a subdivision of Stins Coman that developed this optical technology. Another advantage is its speed. BeamCaster’s light module can transfer data at a speed of 1.25 gigabytes per second, which is the guaranteed speed for transferring data to each working unit. In the near future, the developer will be ready to boost that speed to 5 GB/second - significantly faster than the radio signal that Wi-Fi uses. “We know that the maximum [speed] that a Wi-Fi network is capable of is 300 MB/second (standard 802.11n). And that’s the speed on the entire channel, not for each connected user,” Zayents explained. Scientists have known for quite some time that light waves are good at transferring various types of information. Harald Haas, a professor at Edinburgh University, pioneered the Li-Fi technology when he demonstrated a successful prototype of a device that transfers information using LED radiation three years ago, and even created a company to sell Li-Fi based solutions. Among other things, the creators of the new beam technology assert that their solution is much more secure and environmentally friendly than Wi-Fi. In addition to that, the radio signal used by Wi-Fi can interfere with other electronics; for example, certain medical devices. Of no less importance is the inverse relationship; the light beam is not affected by external electromagnetic fields. The BeamCaster set, which includes a central device plus eight receivers, is currently going for several thousands of dollars on the market. That is a hefty price tag, which is why for now the producers’ main clients are the offices of major companies, such as U.S. telecommunications innovators Arris (for video applications) and Cortina (for maintaining its engineering center), Israel’s Bynet (for servicing its call center), and China’s Soarsky (six systems for its open engineering offices). However, according to the developers, the BeamCaster suite will soon hit stores, with one portal averaging less than $100 in price. Such a price will allow the developers to enter new markets. Nonetheless, experts are skeptical about the project’s future. “The device has several shortcomings, such as the difficulty of positioning the receivers, the inconvenience of working with mobile devices, and the relatively high cost of implementation,” said Vadim Sukhomlinov, Strategic Business Development Manager at Intel in Russia. “I would assess the prospective market for this device in volume at about 5 percent of what Wi-Fi currently occupies. “That said, the solution itself is really promising and interesting. It could be a decent alternative to Wi-Fi for big companies. Besides that, the speed at stationary devices is very high and much more protected than a radio or wire signal,” Sukhmolinov added.